For decades, the crowds of small, dark sea geese on the tundra of southwestern Alaska’s Yukon-Kuskokwim Delta have been thinning, a situation opposite that of geese on the North Slope. 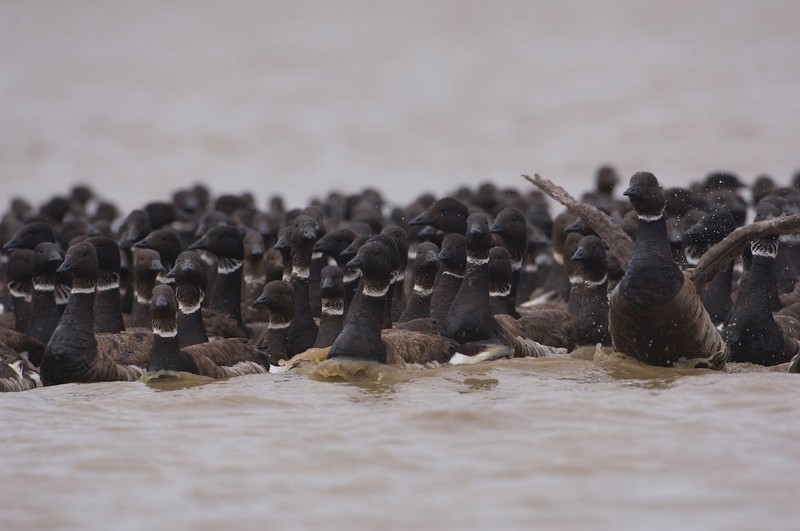 The flat area between the mouths of the big Kuskokwim and Yukon rivers was, in the past, the dominant summer breeding area for the world’s Pacific black brant population, according to earlier scientific reports. But now the future of the brant that breed in the Y-K Delta is clouded. The breeding population there has declined 2 percent to 4 percent annually over the last two decades, according to research by the U.S. Geological Survey. 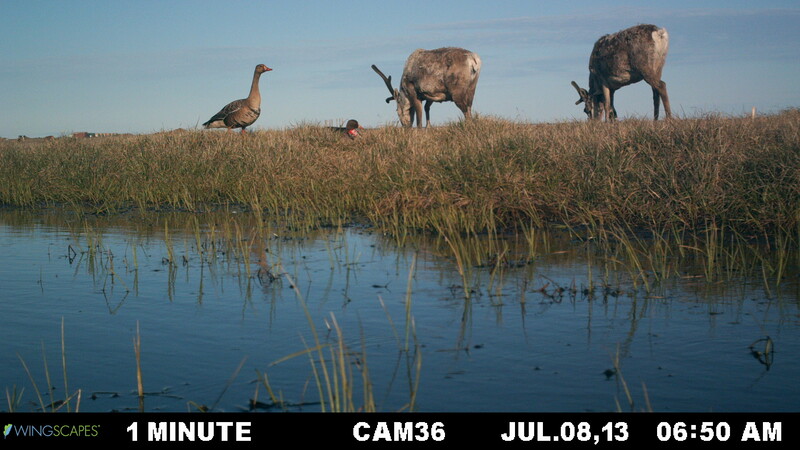 And a new study, published in the Journal of Wildlife Management, found that while about three of every five first-year brant survived in 1990 at one key Yukon-Kuskokwim breeding site, that rate declined to less than one in five by 2015. But 800 miles to the northeast, things are looking up for black brant that migrate in summer to the coastline of the Arctic Ocean. The geese that nest on the North Slope coastline there are apparent climate-change winners, benefiting from a warming-induced vegetation switch that has produced more of the salt-tolerant sedges that pack a bigger nutrition punch than the upland tundra plants they replaced. Loss of sea ice, accelerated erosion and other changes have created more salt marshes with plants that are preferable to black brant. 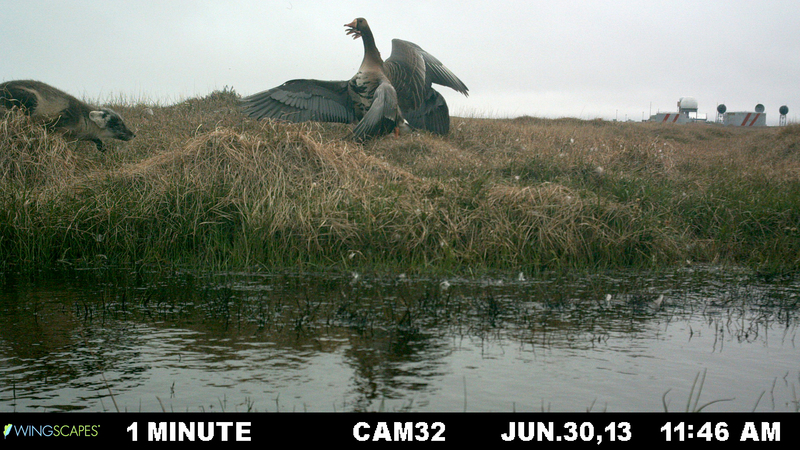 Geese at Lonely Point/Camp Lonely were documented automatically by installed cameras over 2013-14. Their nesting behaviors and interactions with other animals were captured. Fox received a big defensive reaction. Now, goslings born to Arctic-breeding brant grow bigger and faster than those in the Y-K Delta, said Paul Flint, a USGS wildlife biologist. The Arctic goslings, given the advantage of better food availability, are generally 50 percent heavier at 30 days than their more southern counterparts, said Flint, who is an goose expert, though not an author of the survival study. Can Arctic-breeding goose gains make up for declines in the once-dominant Yukon-Kuskokwim-breeding population? Alan Leach of the University of Nevada-Reno, the lead author of the survival study, is doubtful. “To me, they have not documented enough nests yet in the Arctic to offset the loss of nests in the Yukon-Kuskokwim Delta,” he said. Flint, however, sees some hints of North Slope compensation. He cites increases in brant numbers at southwestern Alaska’s Izembek Lagoon area, a site where brant from both the Arctic and the Y-K gather in fall. Nearly a third of the brant spend the winter in Izembek rather than fly farther south, and the overwintering population there has increased by nearly 9 percent a year over the past decade, according to the U.S. Fish and Wildlife Service. The brant story is complicated, Leach and Flint said. The population is difficult to estimate and there are questions about past estimates of distributions, Flint said. There are unanswered questions about populations in Canada and Russia, he said. An important trend found in the survival study: Despite favorable habitat conditions and indications of a population increase there, survival of Arctic-breeding brant has declined since the 1990s, though not as steeply as that of the Yukon-Kuskokwim geese. That leads to questions about conditions at other times of the year along a migratory route that extends as far south as Mexico in winter. One possibility is a loss in the eelgrass that the brant eat along the southern migratory route, Leach said. Whatever might be happening outside of the Alaska breeding season will need a more fine-scaled study to understand, he said. North Slope vegetation changes that are favorable to black brant appear to be helping other geese that breed there. Snow geese, after being almost wiped off the North Slope by hunters in the early 20th century, are back with a vengeance. A small remnant population that numbered less than 1,000 in the second half of the 20th century has grown to about 35,000 now, according to the USGS. The overlap of snow geese and brant on North Slope breeding grounds seems to be no problem, as plant food is plentiful for both species, the USGS has found. White-fronted geese are also thriving on the North Slope, according to the USGS. If there are more geese on the North Slope, are encounters with people and with industrial activities in that oil-rich area a potential problem? Another study newly published in the Journal of Wildlife Management addresses that question. It found some mixed results: Geese appear to be scared off their nests when people approach, but they seem to tolerate the noise and other disturbances created by people’s vehicles and equipment. The opportunity to examine goose reactions came with a recent cleanup of a site holding an abandoned Air Force radar station and an old oil-drilling pad — but is now the nesting site for a growing population of white-fronted geese. To conduct the study, USGS biologists used the 2013-2014 cleanup at Point Lonely, a site near Teshekpuk Lake. They captured about 1.5 million images with cameras installed over both breeding seasons. Through analysis of the images, they tracked goose responses to people, animals and machines in their nesting territory. When people approached the nests, the researchers found, the adult geese tended to flee, leaving their eggs vulnerable to predators. When vehicles drove by or other machines entered the goose space, however, the birds were far more tolerant, staying at their nests, though they often lowered their bodies to make themselves less conspicuous on the flat tundra. “They’ll stretch their neck out flat and try to hug the nest on the ground. But they are not able to hide very well,” Meixell said. The geese stayed put even when there were loud noises from such sources as helicopters, said Flint, a co-author of that study. “It was quite surprising as to the extent they would tolerate that,” he said. The geese were unfazed by caribou wandering through, barely making any kind of squawk, Meixell said. But they went into full attack mode when their nests were approached by foxes, the main predators on the area’s geese and eggs, he said. The fox-goose fights were so fierce that a handful of the female geese died defending their nests, Meixell said. There were no reports of foxes being injured or killed, though many were chased away without a meal.